We can answer any questions you may have about our services or how these products work. Read a sample of commonly asked questions below. SEER is an acronym for Seasonal Energy Efficiency Ratio. The SEER is a rating for air conditioners defined by the Air Conditioning, Heating, and Refrigeration Institute in its 2008 standard AHRI 210/240, Performance Rating of Unitary Air-Conditioning and Air-Source Heat Pump Equipment. The higher the unit’s SEER rating the more energy-efficient it is. Energy Star qualified air conditioners must have a minimal rating of 14. It is rare today to see a unit that is a 9. A high energy-efficient unit should have a rating of 18 although you can find systems with a rating of 20. Residential split-system AC units of SEER 20 or more are now available, but there is a substantial cost over the standard SEER 13 units due to complexity. Substantial energy savings can be obtained by installing a more efficient system. By replacing a SEER 9 with a SEER 13 you can lower your energy cost of running your air conditioning by as much as 30%. Starting January 1, 2015, air conditioners installed in the state of Kentucky must be at least 14 SEER. Air conditioning is the process of altering the properties of air (primarily temperature and humidity) to more favorable conditions. More generally, air conditioning can refer to any form of technological cooling, heating, ventilation, or disinfection that modifies the condition of air. An air conditioner (often referred to as AC) is a major or home appliance, system, or mechanism designed to change the air temperature and humidity within an area (used for cooling and sometimes heating depending on the air properties at a given time). The cooling is typically done using a simple refrigeration cycle, but sometimes evaporation is used, commonly for comfort cooling in buildings and motor vehicles. In construction, a complete system of heating, ventilation and air conditioning is referred to as “HVAC”. The basic concept behind air conditioning is known to have been applied in ancient Egypt where reeds hung in windows had water trickling down. The evaporation of water-cooled the air blowing through the window, though this process also made the air more humid. In Ancient Rome, water from aqueducts was circulated through the walls of certain houses to cool them down. Other techniques in medieval Persia involved the use of cisterns and wind towers to cool buildings during the hot season. Modern air conditioning emerged from advances in chemistry during the 19th century, and the first large-scale electrical air conditioning was invented and used in 1911 by Willis Haviland Carrier. The introduction of residential air conditioning in the 1920s helped start the great migration to the Sunbelt. When should I have my air conditioner serviced/cleaned? Manufactures recommend that air conditioners need to be serviced and cleaned once a year in the spring. Regular maintenance is a requirement of some warranties. The refrigerant needs to be checked which will help your unit be more energy-efficient. By keeping your air conditioner serviced and cleaned on a yearly schedule you will add years to the life expectancy and keep it working at optimal efficiency. A well planned service schedule can save you thousands of dollars over the long-term. Contact Wright Mechanical Services for an economical service plan that will take away the hassle and give you piece of mind. Piece of mind that your air conditioner is being taken care of by a HVAC professional with over 25 years of experience. When I replace my air conditioner should I have a larger unit installed? Not necessarily. If the air conditioner is too large it will always be working on a short cycle. Your air conditioner is at its least efficient when it starts. By cooling your home too quickly the AC unit is always working at its least energy-efficient and actually cost you more on your utilities. Many factors are taken into consideration when determining the size of you AC unit such as, the size of your home, insulation levels, and size of ductwork,etc. As your HVAC professional, Wright Mechanical Services will give you a free assessment to help you determine the right size system for your home. Should I replace my indoor coil? If you are replacing your heat pump or air conditioner than most likely the answer is yes. Efficiency ratings for an air conditioner or heat pump are based on performance as part of a matched system. If only the outdoor portion is replaced, the savings and efficiency may be less than a matched system. Air Conditioners need to have the refrigerant(R-22, 410A) levels checked to make sure it is operating efficiently. The best time to have you’re A/C looked at is in the Spring. How do I know if the warranty on my heating or air conditioning system is still valid? Locate the label on the outside of the unit and look for a manufacture date. If the equipment is less then five years old then most likely the equipment is still covered under the manufacturer’s warranty. Warranty terms and conditions change depending on the manufacturer and the installing company. Wright Mechanical Services can verify the status of the warranty of any of your HVAC equipment. How do I know if I should replace or repair air conditioning unit? There are many factors to take into consideration. Is this your long-term residence? How old is the unit? Do your utility bills seem high? A good rule of thumb, if your AC is 10 years or more old and requires costly repairs ($500 or more), it is most likely time to consider a new unit. A new AC unit will be more reliable, energy efficient, comfortable, and will be covered by a warranty. Something else to take into account is that the new AC unit will certainly be much more energy efficient lowering the cost of cooling your home. If you plan on living in the residence long term then a new HVAC system that is reliable, energy efficient, and keeps your family comfortable makes the most sense. Why does my AC unit freeze up? There are many reasons why your AC unit would freeze up and almost all of them make it a necessity to call an HVAC professional. Once you have determined that the air filter is clean or replaced and the airflow is not restricted then it is time to call a professional technician. Low Refrigerant. It is a possibility that the freezing up is being caused by a leak in the refrigerant lines.There could be numerous places the lines could be leaking or it could be a leaking valve or even a loose fitting. Dirty Evaporator. The evaporator coil will become dirty over time. Dust and debris will build up and restrict the airflow just like having dirty air filters. This is why it is important to conduct regular maintenance to avoid these kinds of problems. You will lose airflow slowly enough that you might not even notice until it freezes up or is not cooling adequately. Defective Blower motor or relay. A blower motor not running at the proper speed or not running at all can cause the air conditioner to freeze up. Also, it can cause the blower motor to work erratically. It will start at full speed then slow down after it heats up. After you successfully eliminate restricted airflow or a dirty air filter and it happens again it is time to call a HVAC service expert to diagnose the problem. 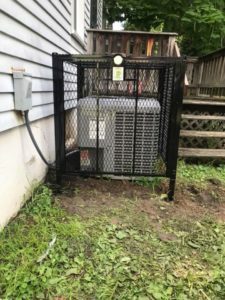 How do I keep thieves from stealing my air conditioning unit? A security cage will secure your outside AC unit from thieves. If air conditioning security is a problem then we have the solution. We have several proven methods to stop thieves from damaging or stealing your air conditioning equipment. Our air conditioning security cages are installed quickly and will keep the equipment safe and sound.